We actually spent two half-days here as we had the drive from Denver through to Utah and back on these days which took over 5 hours but you can definitely fit everything into one day. There are so many beautiful places in Arches National Park and so many amazing trails and rock formations. Most of the trails are pretty easy but there are a couple which require some off-piste action – i.e. you have to scramble over rocks. The toughest hike is probably Delicate Arch (pictured) but it’s also the best and most famous arch in the park. It’s a tough hike up a steep rock face but it’s not a long hike so it’s doable. Make sure you wear appropriate clothing though, I saw one girl in a maxi dress and sandals (clearly for the ‘Gram) but if you want to do this take the pretty dress in a bag and change at the top. It’s just dangerous otherwise. 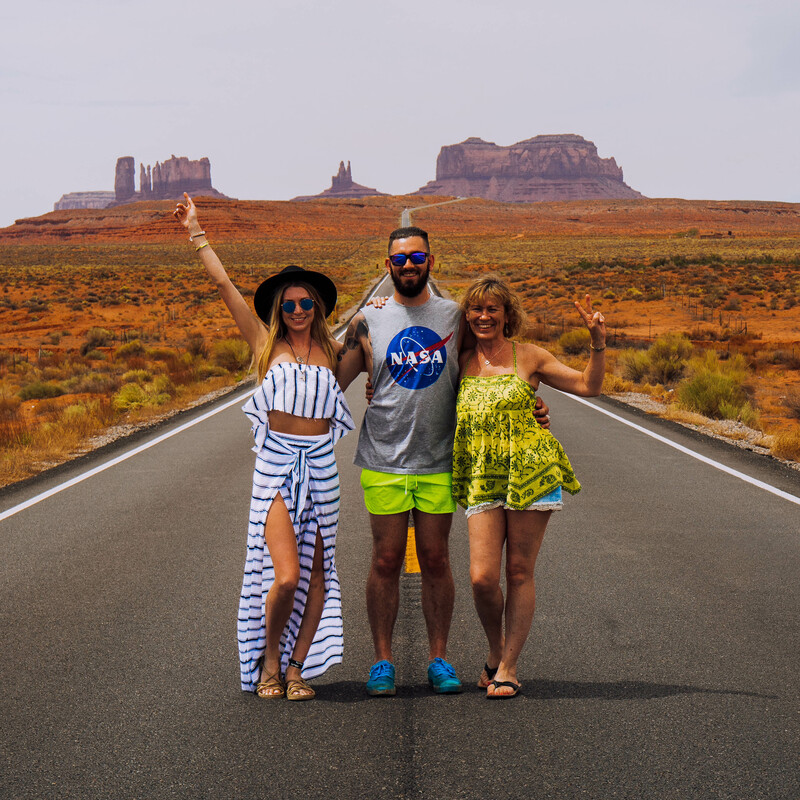 The drive from Moab to Page takes you through Monument Valley aka the Forrest Gump Road (you know, the place where he’s been running for ages and finally decides to stop and go home?) . This is literally Roadrunner and Wylie Coyote’s back garden and the landscape is insane! On the way down to Monument Valley I would highly recommend stopping off at a rock formation called Mexican Hat. Unsurprisingly, the formation looks like a huge sombrero upside down on the top of a huge rock. Follow the road down and round the back of the formation and you’ll find yourself on a river bank which is a nice place to stop and I doubt many tourists even realise it’s there. Monument Valley itself has plenty of places to stop on the side of the road to get the classic photo you can see here and it’s not packed with other cars and tourists so its easy to get a nice shot. Horseshoe Bend is crazy. It’s so huge and scary but so beautiful. It’s also very busy during the day (we arrived in the mid-afternoon) but people just queue up for the best photo spots. There are NO barriers. Pleasse, pleaseee do not stand right on the edge. It’s not worth it – just a few days before we visited someone fell off the top… The car park is pretty much right at the bend so the walk there is easy and only takes 5 minutes or so. This is one of those bucket list places and loads of photographers get here for sunrise and sunset as the lighting looks magical. It’s an incredible place at all times of the day. We spent the night on a Navajo sheep ranch – the Shash Dine Eco Retreat – which I found on Air BnB. There is no electricity, no running water and limited phone signal but spending a night under the stars cut off from the real world was such an experience. The owners of the ranch, Baya and Paul, were so welcoming and made us feel at home. They also had about 8 dogs and cats who spent the night with us by the tents and were adorable. I highly recommend this experience to you guys as we thoroughly enjoyed it. The accommodation is a mixture of bell tents, traditional wagons and huts and can sleep multiple people in each. Our bell tent slept 4. The toilet facilities are traditional outhouses and are kept very clean and tidy. Showering is also done outside in a wooden structure with fresh buckets of water. These can be heated but I opted for showering straight from the bucket to freshen up – it was so hot outside that the cold water on my skin felt amazing. We decided to explore the area around Page and the huge Lake Powell. The drive to this viewpoint takes you through a town called Big Water, after which the route becomes semi off-road (some of it was quite tricky) but the end result was so worth it. You can drive right to the edge like this but I recommend walking around the area as there are so many beautiful angles to see. The drive takes you across the top of the canyon and the landscape looks out of this world – the stone is paler and it genuinely looks like you’ve landed on the moon in places. We also stopped off at Lone Rock beach which is a beach on the edge of Lake Powell with a single huge rock in the centre of the water and is worth a visit if you have time. If you stay in Page make sure you go for dinner at Into the Grand. This restaurant serves traditional Navajo food and your dinner service is accompanied by a performance of Navajo style dance and song. The hoop dance was my favourite part of the show and it’s pretty spectacular! Antelope Canyon was one of the main places I wanted to see on this trip. I’ve seen so many beautiful photos but the canyon really has to be seen in person. We chose to do the Upper Antelope Canyon tour. This is considered to be the best of the two (Upper and Lower) and it’s where you can see the heart of the canyon pictured here. The best time to go is around 11am-1pm as this is when the sun is directly overhead and you can see the beams of light that fall into the canyon which really is magical. Unfortunately this means that it’s also really busy and you are almost rushed through with hundreds of other people. To get good photos and be less crowded, I’d recommend the Lower canyon tour too. The Navajo guides are very knowledgable and will help you with your camera or phone settings to get the best photos in the best places. After Antelope Canyon we drove out to the Coral Pink Sand Dunes. The dunes are located in the middle of the red mountains by Zion National Park and the landscape is so beautiful. You can rent buggies to cruise around on the dunes but we chose to climb up the sandy mountains on foot and run along the peaks, jumping off the top and running down the slopes like big kids. Some of the vegetation around the dunes is thorny and so make sure you’re wearing shoes for the climb down if you visit. We hadn’t planned to visit the sand dunes this day and so we returned to Page where we had booked to stay for this night however the sand dunes are pretty close to a town called Kanab which also has great accommodation available and will save you time driving. Kanarra Falls in the small town of Kanaraville is a pleasant hike and isn’t too strenuous. The hike starts on a trail but you end up walking through the river towards the end so don’t be worried about getting your feet wet as there’s no option if you want to finish the hike. There are a couple of waterfalls along the river – one has a ladder and one you have to climb up the rocks at the side. The ladder is very slippery so wear sturdy shoes and take care when climbing this section. After the two waterfalls you will come to a pool with a rock slide which is good fun, especially when it’s hot. This is one of the lesser-known trails that we hiked but it’s definitely worth it if you have 2-3 hours to spare! After Kanarra Falls, we drove to my favourite National Park on our trip – Zion. Zion has recently been voted the second most beautiful National Park in the US, after Yosemite, and it’s clear to see why. The huge sheer rock faces of orange stone surrounded by vibrant green vegetation is stunning, and the hikes here are second to none. The most beautiful hike is Angel’s Landing, but it’s an incredibly strenuous hike which ends by scaling the rock face with nothing but a metal chain to hold onto and a 1,000ft drop on either side. I’m terrified of heights and about halfway along the chain section where the ground levels out I decided it was best not to go any further (I actually cried because I was so scared and I’ve got sweaty palms just thinking about it). Unless you’re confident and able I really wouldn’t recommend going all the way to the end and there are signs informing you that people have fallen from the trail in the past. The views from the safer paths are so stunning and you won’t miss out if you don’t attempt the sketchy final section! Other popular hikes here are the Zion Narrows, and the Emerald Pools. You need a permit for part of the Narrows so make sure you plan your trip in advance. Bryce Canyon – home of the Hoodoos: the column shaped rock formations, shaped by water, that cover this canyon. There are lots of different trails in this park – I would recommend taking the rim trail around the top of the canyon to get a good view of the vastness of the place. We then walked down into the canyon amongst the hoodoos and along the trail to Thor’s Hammer – a hoodoo that’s topped with a shape that looks like Thor’s hammer. As I’m a big fan of Chris Hemsworth this was a must-see for me hehe! You can take horse rides through the canyon although it was pretty hot and some of the trail is quite steep so I didn’t agree with the rides and we chose to walk. I’m sure the horses love it but it’s not something I would have felt comfortable doing. There’s not a lot of places close to Bryce Canyon in terms of accommodation. We stayed at the Best Western Ruby’s Inn which is just outside the park and is huge but it was totally full the day we were there so book in advance or you’ll have a longer drive at the end of the day. I’d seen the Mystic Hot Springs on Instagram and thought it looked pretty cool and quirky so wanted to stop there on this trip. It is slightly out of the way but definitely worth a visit. The water runs into bathtubs which have been placed on the hill along with two bigger pools for more than one person to use. There’s a real hippie vibe about the place. Soaking passes last for 6 hours and the springs are open 24 hours a day. My skin felt amazing after spending a couple of hours in the water. Ozzy and Jack Osborne recently visited Mystic Hot Springs too, unfortunately not on the day we were there though! After the hot springs we completed our road trip by driving back across Utah to Moab where we visited Canyonlands National Park. This National Park is right next to Arches National Park so you could see both of these places at the same time if you wish. As we were doing a circular round trip we decided to save it til last. The most popular attractions here are the Green River overlook (pictured) and Mesa Arch. There’s also the crater from a meteor impact which is cool but definitely not as beautiful as all of the canyons. The hikes here are pretty easy and short – some of them you pretty much drive straight up to which was nice after a busy week of hard hiking. Utah is pretty strict and it’s illegal to serve someone alcohol in Utah unless they are ordering food and even then the servers have to restrict the amount you’re allowed to drink. But American beer isn’t great (sorry guys but it’s true) so it’s not that much of an issue. You’re also not supposed to drink alcohol on Navajo (Native American) Reserves. Tumbleweeds are a very real thing. And they’re everywhere. And they do roll across the road like in the movies and the cartoons and it is more amusing than it should be. It’s sandy and dusty everywhere – you’re in the desert after all. The sand sticks to everything, especially your face, and gets in your hair and mouth and it did give us a bit of a cough but you get used to it. The areas we visited in Arizona are currently in the middle of quite a bad drought so be mindful of this when using water and try not to waste too much. The land is also suffering and people who keep animals are struggling to feed them all due to the lack of water for the vegetation to regrow so stick to all paths and trails and don’t wander off trampling all over the plants as they are delicate. You shouldn’t really be doing this anywhere whether there’s a drought or not to be honest guys! There are snakes and other creepy stuff in the desert that can hurt you. Trust me, I nearly stepped on one of the snakes we saw. Just watch your step especially in the morning and evening outside of the baking hot middle of the day sunlight. There are some really popular spots that we weren’t able to include in this trip because you have to apply for a permit. Many permits have to be applied for at the start of the year or at least a few months in advance so bear this in mind. The three places that we had wanted to see but couldn’t were The Wave, The Zion Narrows (top end) and Havasu Falls. Do your research on permits before you plan your trip. National Parks cost around $20 to enter in a vehicle with 4 people inside however there’s an annual pass that allows you to enter so many different places in the US as many times as you want (4 people in one car) in the calendar year for $80. Buy this pass, it will save you a lot of money. As promised, here is the itinerary for my trip so you guys can re-create my plan. I’ve included the drive times between each location (as per google maps) and the hotels and motels we stayed in each night. I neeeeeed to see tumbleweeds in real life!! Super article love! I really want to visit those places now! Hahaha I know right it was so funny!